We had a great time hanging out on Cape York and we were enthusiastic about the opportunity to get together again. Little did we know it would be among our favorite experiences so far. 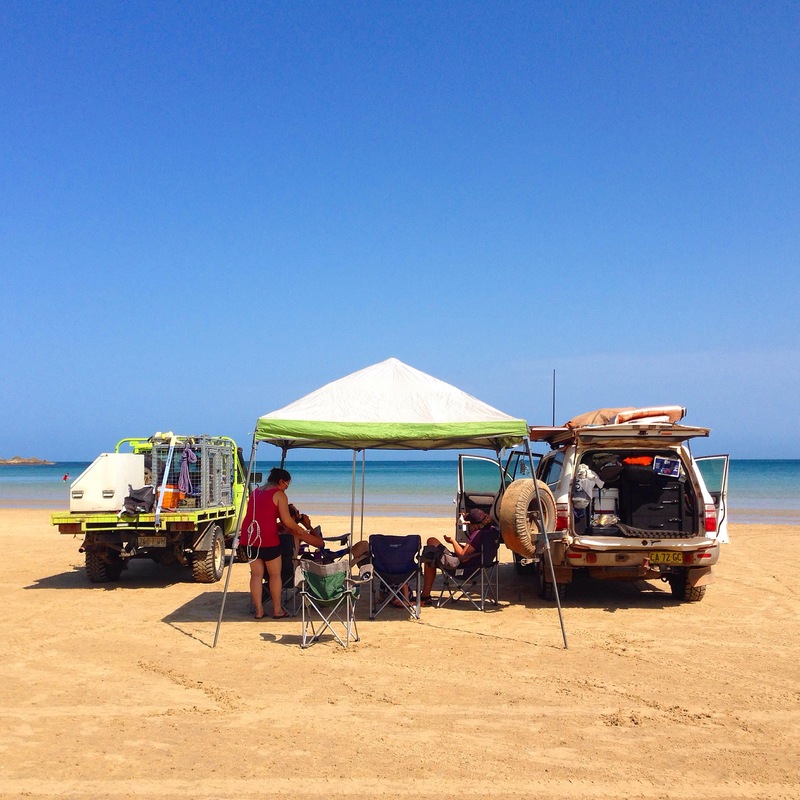 We met up in Yeppoon while we were in search of a laundromat after many days bush camping. Cameron scoffed at the notion and led us out of town to his place with a promise of a washing machine and a tasty dinner. We followed him on a winding road towards Byfield National Park and eventually pulled into a dirt driveway lined with macadamia trees, mango trees, green paddocks and tractors. Our morning got off to a quick start as we dove into a bunch of activities designed to engage the boys. They began a bit timid and fearful of Tiny, a very small 12 lb dog. Cameron led us down a hill to where we could all feed the cows on his property. The boys looked skeptically at the cows, tossing food far past the cows rather than feeding them with their hands. 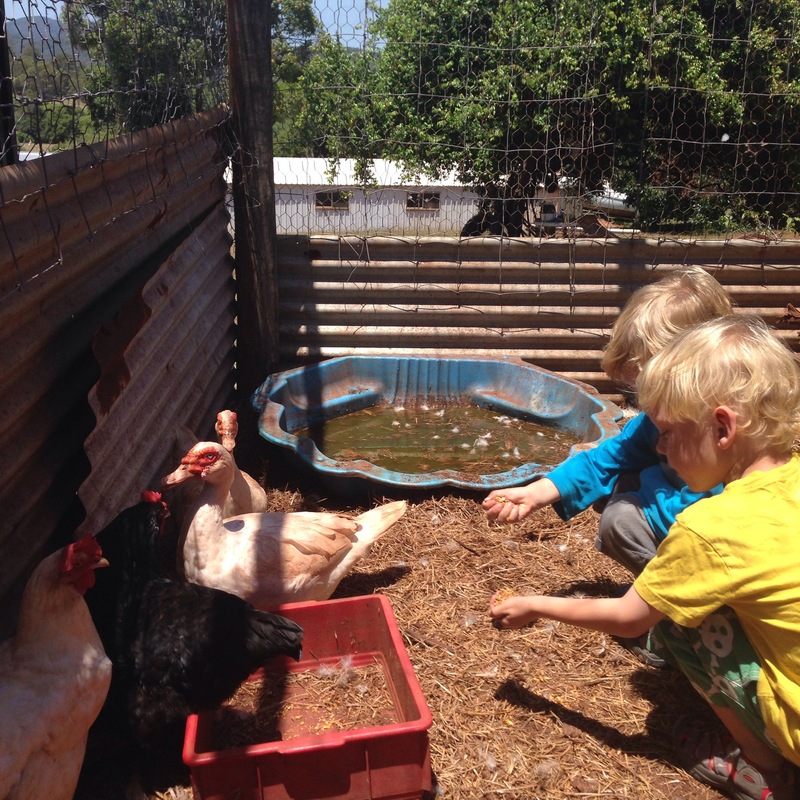 When we fed the chooks, the boys started out hiding behind me, but slowly peeked around me to eye the birds. In this case, the feeling was mutual. The birds were apprehensive about the small new visitors to their coop. Fifteen minutes later they were crouching down with the chooks pecking the food from their hands. Their bond grew over the next few days. The boys would enthusiastically head up the small hill with a bag of food scraps in search of fresh eggs. The chooks also adjusted to the boys presence, meeting the boys eagerly at the door to the coop awaiting their morning feed. 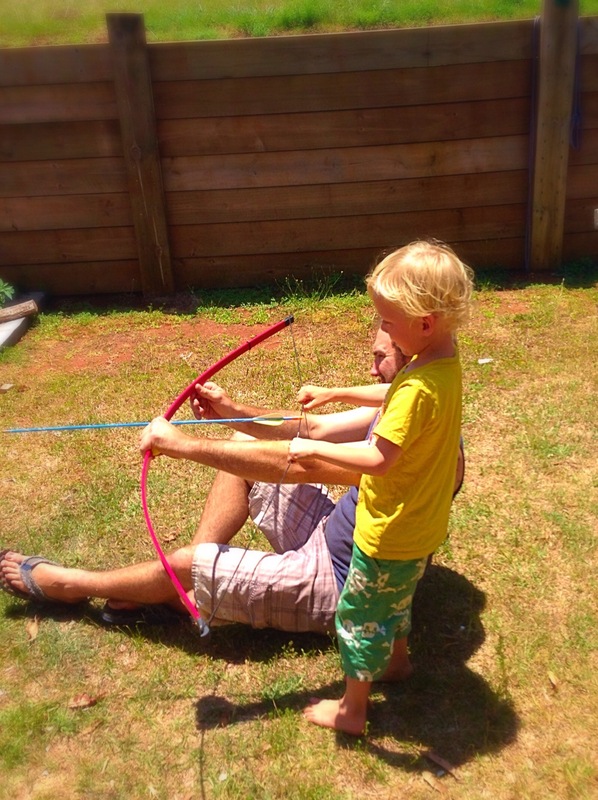 The boys got a bow and arrow lesson while we pulled together lunch. This was quite a treat as the boys had been trying to devise a way to make their own bow and arrows for the previous week at our various stops. I thought that the smile might explode off of their faces as they tried to carefully line up the arrow towards the box target. Our next stop after picking fresh tomatoes was to crush the fresh macadamia nuts for a snack. After a brief discussion about whether we should use a brick with a nut sized divot for cracking the shells, our hosts opted for a vice. The boys took turns winding the vice just far enough to split the shell before unwinding and revealing the yummy snack. It’s a rare opportunity for me to eat such fresh nuts. I am much more accustomed to the variety that lingers on supermarket shelves for many months before they arrive in my stomach so it was a great treat. Next up was a seat on the large tractor and then a trip around to the lawn where the boys got to drive the ride on mower. I am aware that ride on mowers are not exotic for our suburban readers, but given that our backyard in Brooklyn was a tiny patch of cement and bricks, it still counts as pretty cool for our small team. In the midst of all of this excitement, Cameron was prepping a pork roast and whole chicken for the rotisserie, which we would enjoy that evening. We rested for a bit in the afternoon to avoid the heat of the day and then headed out to walk through the back of the property. We stepped through the barb wire cattle fence to explore over the hill. I showed my city stripes as I inelegantly struggled through the fence managing to catch my shorts on both trips through it. Our walk through the property rivaled any paid nature walk I can imagine. Cameron pointed out holes that the kangaroos dug to reach fresh water, native plants and insidious introduced weeds, the sheen of the mango tree leaves, inflated pods that could be stomped on to produce a large pop and so much more. That night we were treated to the delicious rotisserie and we had the opportunity to meet Cameron’s parents too which was a treat. A whole evening of adult conversation! The following day we headed to Byfield National Park. We took a walk through the forest seeing lots of interesting birds, trees and even a slithering resident. I did not spend much time looking at the s-n-a-k-e. They are not my scene and as much as I push myself to do things that scare me, I remain comfortable with my phobia on this kind… And I was glad the boys who had someone who could look at it with them. After a swim in the river and a lunch at the picnic tables we drove on towards the beach. I know I have previously mentioned the way that corrugated roads have a way of shaking random things loose. Well on this stretch of road, the peanut butter jar managed to shake it’s cap loose. This wouldn’t have been an enormous problem if I would buy the regular hydrogenated stuff, but since I have gone the pure peanut kind, it resulted in an unseemly mess all over our car floor. While I cleaned up the mess, Benita, Cameron and Jay let the tires down. Cameron warned us that there was a long hill with deep sand a few turns ahead. After a quick discussion, we headed out in low 2 aiming to maintain momentum up the hill. We bounced and pitched a bit, but Cave Lion did us proud and we emerged at the top of the hill to a beautiful view of the ocean. We spent the afternoon on the beach. The kids built sand castles. 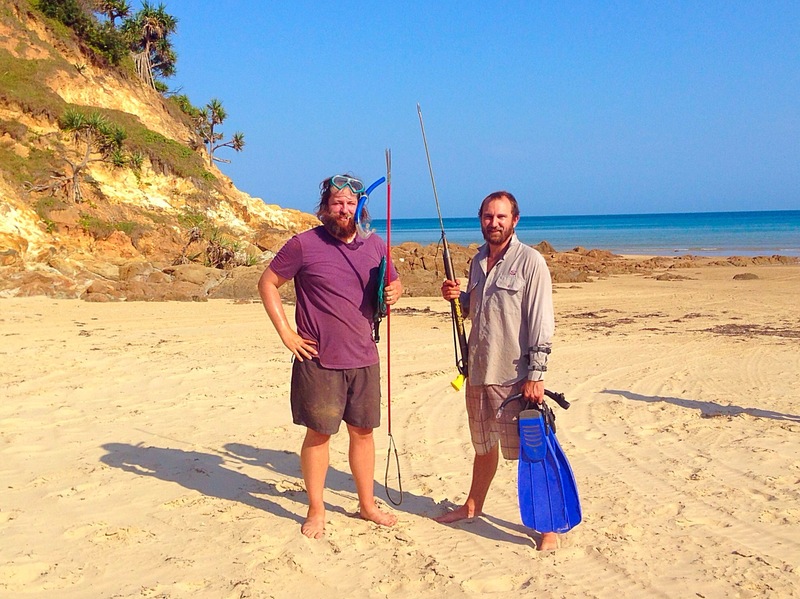 There was a brief sojourn out in hopes of catching some dinner spearfishing. But the equipment was not cooperating and a swarm of sea lice came our way, so we abandoned that plan in favor of a hike up to a fresh water waterfall. All in all a lovely day. The next couple of days were a whirlwind of errands, delicious meals and some amazing repair work from Cameron. He replaced the (second) faulty water pump in our trailer, fixed a few items that were dinged on the trailer on the Tele track and a whole bunch of other little items that will improve our camping quality of life. 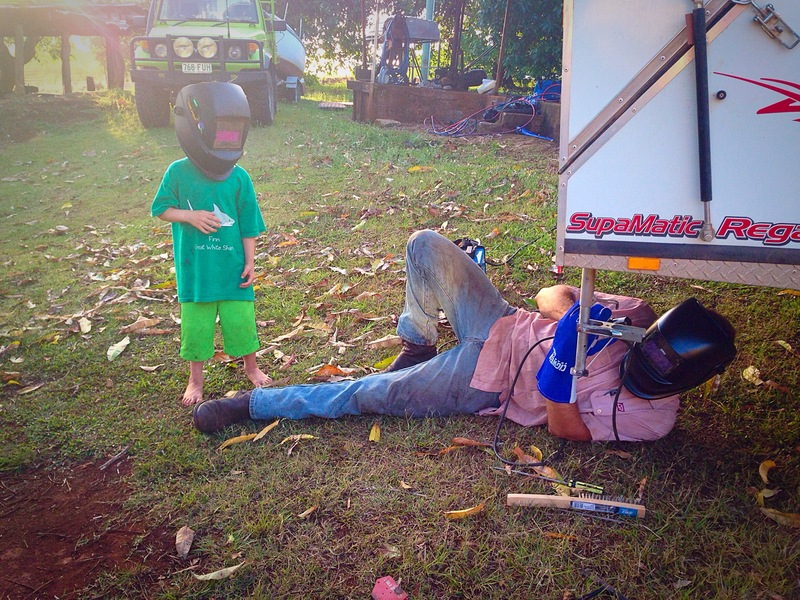 The welding project was a particular favorite of the boys as it yielded the opportunity to wear a “Darth Vader” mask! And when that was all done, Jay, Cameron and a generous friend of Cameron’s did the 200,000km service on Cave Lion and made sure she was ready for our trek through the desert. Such a fabulous stop. So appreciate our welcoming hosts, the delicious food and even better conversations! Hoping to find a way to connect with them somewhere on the road in the future! Love that he has Percy on the tractor! Love that you were so well cared for!! Safe travels into the desert!! Just read about you guys in the news and wanted to say welcome to life on the road in this beautiful country of ours. We’re a family of four who are 10 mths into a 12 mth adventure and are loving every moment. Take care, enjoy, and know that you are doing a wonderful thing for your family. Thanks so much. We love meeting other traveling families! Make sure you come to southern NSW and visit the high country from south of Canberra and beyond into Victoria. Different heat and very dry this time of year. Very jealous of your year off. Regards. Rita from Royalla. Thanks Rita. We plan to make it that way over the next couple of months. We’re looking forward to it! Loads of fabulous experiences with our kids in wonderful places. G’day guys, just heard your story on abc radio as we are travelling from Mildura, Victoria to Brisbane Queensland. We too are a travelling family (of 5). We are intending on doing the ‘big lap’ sometime soon. Thanks Troy! If you get this, please email us at milesfrombrooklyn at gmail.com so we can get in touch! I just heard your story on the ABC radio and had to look up you adventures. I am an American living in rural Australia with my husband. I grew up in Colorado. My husband and I met in Toowoomba at university. We got married 3 years ago and moved to his family farm. If you are heading south from Longreach you are more then welcome to stop in. We are about 5 hours inland from Brisbane. We grow crops and have cattle. We just finished our wheat harvest but have a crop of sorghum growing that the boys might like 🙂 I think this trip is a great idea and it looks like you are having a fabulous time!